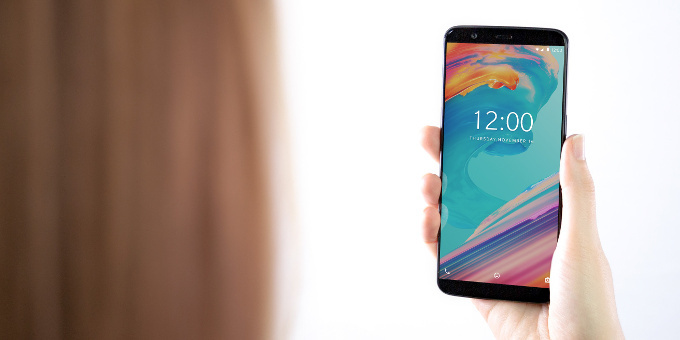 The OnePlus 5T goes official and now sports the trendy 18:9 screen aspect ratio. Physically, the OnePlus 5T looks very much like the OnePlus 5 - made of glass and aluminum with almost the same dimensions. This time around, it packs a 6-inch Optic AMOLED display of 1080p Full HD resolution with the new 18:9 aspect ratio. Under the hood, one can find the flagship octa-core Qualcomm Snapdragon 835 chipset with 6GB/8GB RAM and 64GB/128GB of non-expandable storage. Like the OnePlus 5, this too runs OxygenOS based on Android 7.1.1 Nougat. The original OnePlus 5 came with dual rear cameras, and it's the same case with the OnePlus 5T. However, instead of two 16-MP lens, the latter packs one 20-MP lens and another 16-MP lens. They have an f/1.7 aperture with EIS (electronic image stabilization), phase detection auto-focus, and dual-LED flash. The OnePlus 5T has also ditched the telephoto lens for better low-light photography. It also features Portrait Mode using software algorithms. A 16-MP front camera with EIS is also on board. Similar to the iPhone X, the OnePlus 5T supports Face Unlock through its front camera though nowhere as secure as the Face ID of the former. However, the OnePlus 5 supplements it with a rear-mounted fingerprint scanner. A non-removable 3,300 mAh battery will power the new OnePlus smartphone and it supports fast charging. Only available in a single color variant - Midnight Black, the OnePlus 5T also costs a bit higher than its predecessor at $500 in the United States. The device will also be available in Canada, Europe, China, Hong Kong, India and more.